Women are inventing family histories of breast cancer in order to have treatment, doctors have revealed. Geneticists in Manchester say this can lead to patients having surgery to remove their breasts, only for doctors to discover that it was unnecessary. They say the women, 1% of patients, are likely to have a psychological disorder similar to Munchausen's Syndrome. 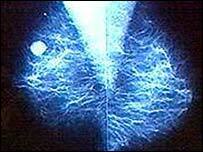 Around 5% of the 40,000 cases of breast cancer diagnosed in the UK every year are linked to high-risk genes. The geneticists at St Mary's Hospital said a small number, around 1%, of women claiming the most serious family risk of breast cancer - where three of four relatives develop the disease when young - were inventing the history. Women who do have this kind of family history sometimes opt for preventative treatment, which may include surgery to remove the breasts. But experts warn that, if patient's claims are not investigated, they may undergo unnecessary surgery, and cause fears among relatives that they may have a high risk of cancer. Professor Gareth Evans, a consultant in medical genetics at St Mary's hospital in Manchester, said: "The women should go through a process of risk assessment with a geneticist, and also have a psychological assessment. "With all of those in place women should no longer be getting surgery in that situation. "Unfortunately it appears that women still are getting surgery, so some surgeons are still not going through the protocol as they should." Professor Evans said restrictions under the Data Protection Act have made it harder for doctors to verify what patients are saying if they will not consent to having their family histories investigated. "What we are concerned about are people who actually are fabricating it, know they're fabricating it, and they're the last people who are actually going to sign a consent form that's going to let you find out that they haven't actually had what they say they've had." Melease Crosby, from Partington in Greater Manchester, has the flawed BRCA1 gene which makes her susceptible to breast cancer. She was diagnosed with the disease five years ago, and has had several operations, including both breasts removed. Her mother, Sandra, has also had breast cancer. Next week her daughter Louise will be tested to see if she has inherited the faulty gene. Melease is shocked that anyone might invent a family history such as hers. "Until they tell you that you've got this faulty gene you don't want to think about it. And then when you are told that you've got a faulty gene it's a shock. But then you've got to deal with it. "I think it's communication, the way you are with your children, how open you are with them. And I think we've been that with our children." Simon Wessley, a professor of psychiatric medicine at King's College London, says it's much more common for patients to say things that are true and doctors don't believe them. But he says some people do invent family histories in this way to draw attention to themselves. "There are one or two people who actually enjoy the privileges, as it were, of being sick....the fact that people are nicer to you, you get sympathy, you get seen as the brave patient, and so on and so forth. "There are one or two people who do get a perverse pleasure from assuming this role to which they are not entitled." Sarah Rawlings, Breakthrough Breast Cancer's Policy Manager, said: "Preventative surgery should only be offered to women with a strong family history who have gone through professional risk and psychological assessment. "It's essential that this takes place to ensure that only those women that need these services are able to access them. "Women with a family history should not be afraid to discuss their issues with a GP and get the support and advice they need. "It is also important that relatives talk to each other about their health so they are aware of any diseases that run in the family."